It features the adorable Tulip Bunny image from Bugaboo Stamps... it's colored with Copics and the sentiment is computer generated. I used My Favorite Things dies for the stitched flowers, pierced rectangle and fishtail flag. 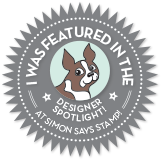 I used a Lawn Fawn die for the Zig Zag rectangle, a Sizzix/Tim Holtz die for the double stitched rectangle and a Simon Says Stamp die for the stitched square. 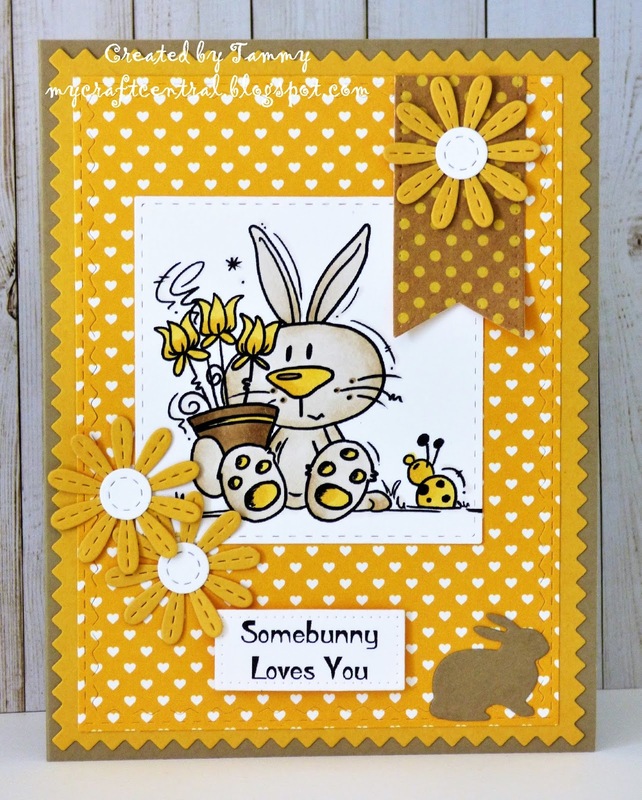 The little bunny in the corner was cut with a Poppy Stamps die and the heart paper is from My Favorite Things. Today starts a new challenge at Back to Basics and Beyond and this time we would like you to create a card/project using a spray! For the base of my card- I laid my Tim Holtz Latticework stencil over a piece of mixed media paper and sprayed it with Tim Holtz Resist Spray. Once dry I sprayed it with Distress Oxide Picked Raspberry and Spiced Marmalade sprays. For the flowers- I sponged Picked Raspberry, Spiced Marmalade and Peeled Paint Distress inks onto scraps of mixed media paper, stamped the fabulous Scribble Flowers from Simon Says stamp and cut them out with the coordinating dies. 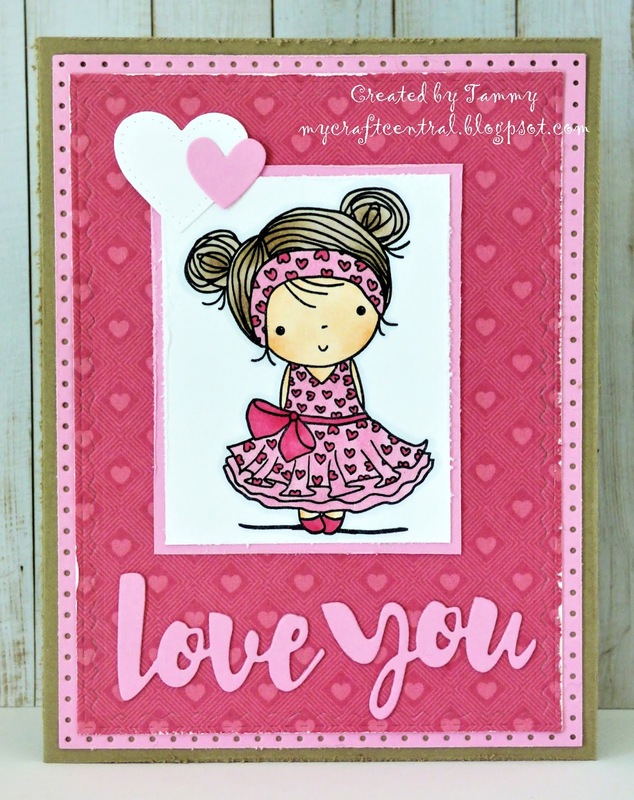 The sentiments are from Mama Elephant, stamped with VersaFine ink and heat embossed. I had so much fun making this card and I really like how colorful it turned out... it's going to be perfect for one of my nieces! Thanks so much for stopping by and don't forget to pop on over to the main challenge blog to check out the rest of the teams beautiful 'Spray' creations! A new challenge starts today over at Cardz 4 Galz and the theme is Pretty Papers so we would like you to use 2 or more pattern papers. My card features a cute Riley image... it's stamped with black licorice ink onto cream cardstock and colored with Copics. I used 4 different pattern papers from My Minds Eye and the sentiment is from Wplus9. I used a Simon Says Stamp die for the large stitched rectangle and My Favorite Things dies for the flowers, stitched circle and fishtail flag. To finish it up I added gold sequins and twine with a tiny punched heart. I hope you can join us and don't forget to pop on over to the main challenge blog to check out the rest of the teams creations. Thanks so much for stopping by... your comments always make my day! 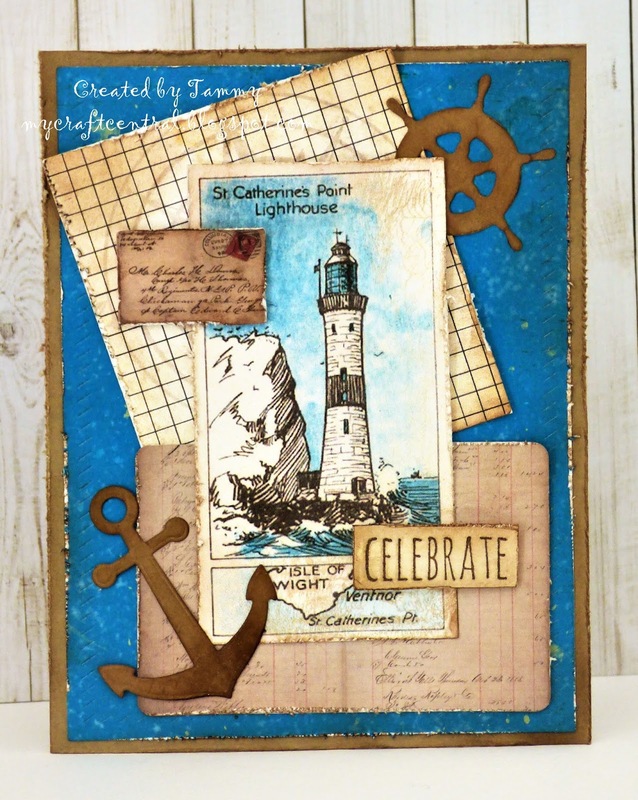 I used a couple of vintage lighthouse printables from Create with TLC and paired them with Tim Holtz Ephemera pieces, the sentiment is also from Tim Holtz. I used Momenta dies for the ship's wheel and anchor. I added some Tim Holtz Distress Collage medium to the main image for a slight crackle effect and all of the edges were distressed with Walnut Stain ink. Today starts a new challenge at Back to Basics and Beyond and this time we have a recipe for you to follow... 1 image - 2 colors - 3 gems, pearls or jewels. 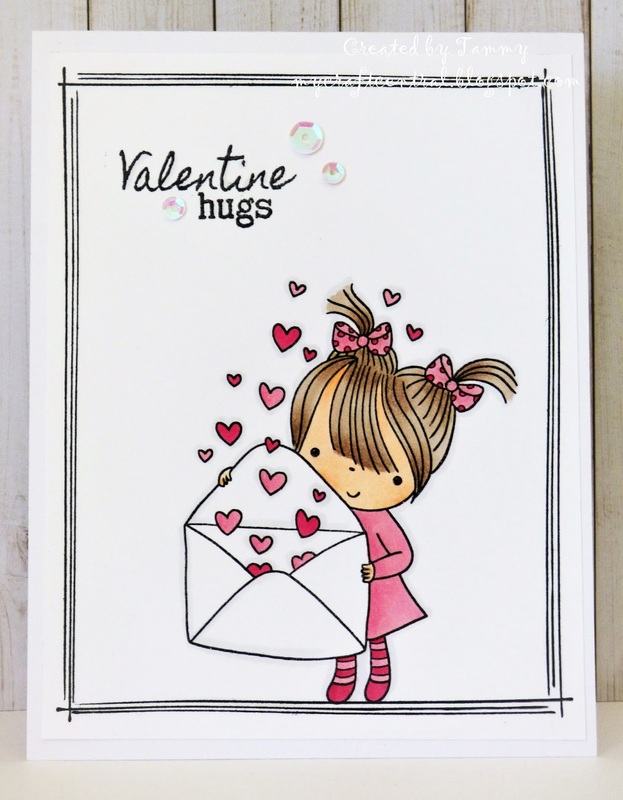 My card features a cute image from Bugaboo Stamps and I wanted to use pink and white for my 2 colors so I kept the Copic coloring to a minimum and this image is perfect for that! 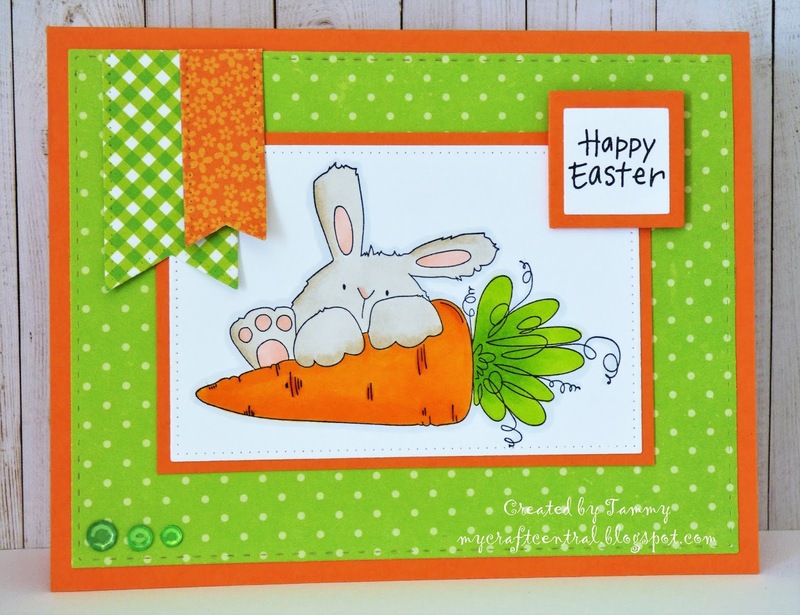 The sentiment is from Penny Black and the fun rabbit paper is from Echo Park. I used My Favorite Things Blueprints 15 and Office Supplies dies to cut everything out... to finish it up I added 3 tiny pink gems. I hope you can join us and don't forget to pop on over to the main challenge blog to check out the rest of the teams beautiful creations! A new challenge starts today over at Cardz 4 Galz and the theme is Flora or Fauna... so we would like to see Flowers and/or Animals on your cards. 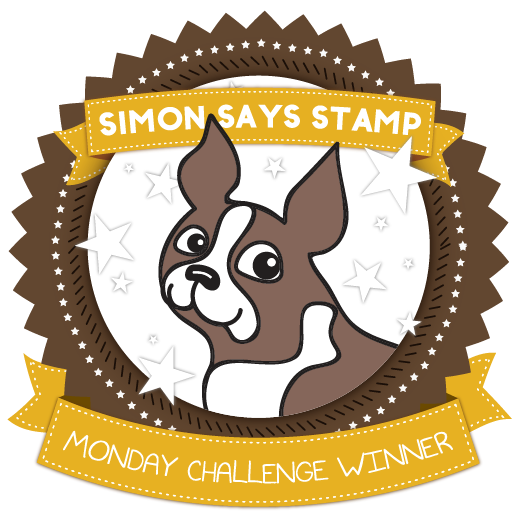 Simon Says Stamp Work it Wednesday- Spring Flowers! 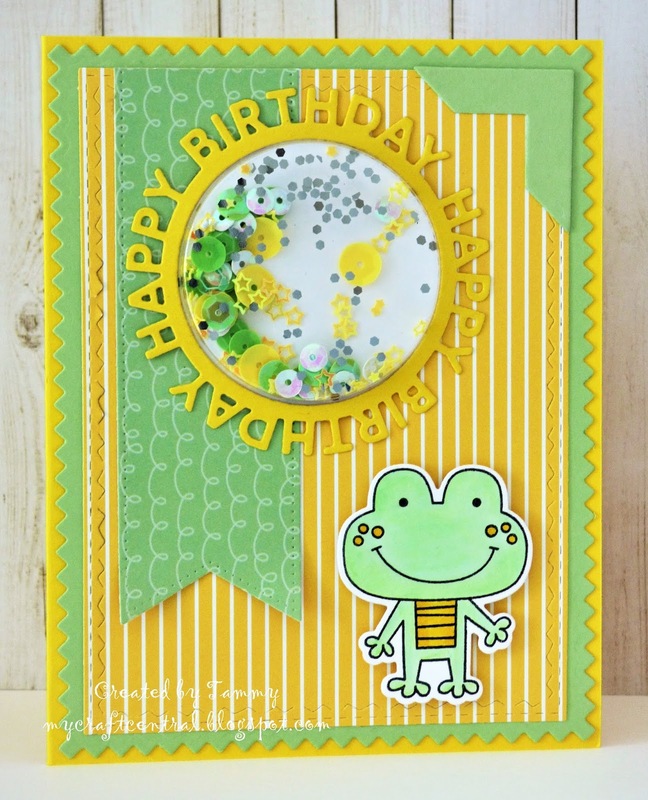 For my card I used my new My Favorite Things Happy Birthday circle frame die along with a circle shaker pouch. The cute little frog is from My Favorite Things and it's colored with Copics. I used a Tim Holtz die for the stitched rectangle, a Lawn Fawn die for the zig zag rectangle and My Favorite Things dies for the fishtail flag and corner. That's it for now... thanks so much for stopping by and don't forget to pop on over to the main challenge blog to check out the rest of the teams beautiful creations! My card features a very cute image from Stamping Bella... it's stamped with Black licorice ink, colored with Copics and the sentiment is from Stampendous. I used a Simon Says Stamp die for the stitched rectangle and My Favorite Things dies for the pierced rectangle and fishtail flags, to finish it up I added some green gems. 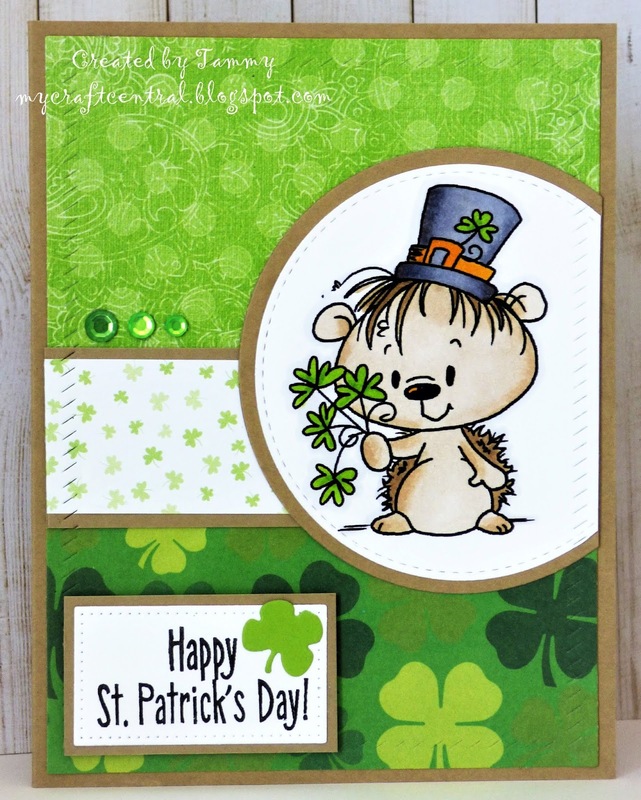 It features a cute little hedgie from Bugaboo Stamps, it's colored with Copics and the sentiment is from Hero Arts. I used My Favorite Things dies for the shamrock, stitched circle and pierced rectangle. The papers are from The Paper Studio and to finish it up I added some lime green gems. It's time for a new challenge at Back to Basics and Beyond and this time we are playing BINGO! 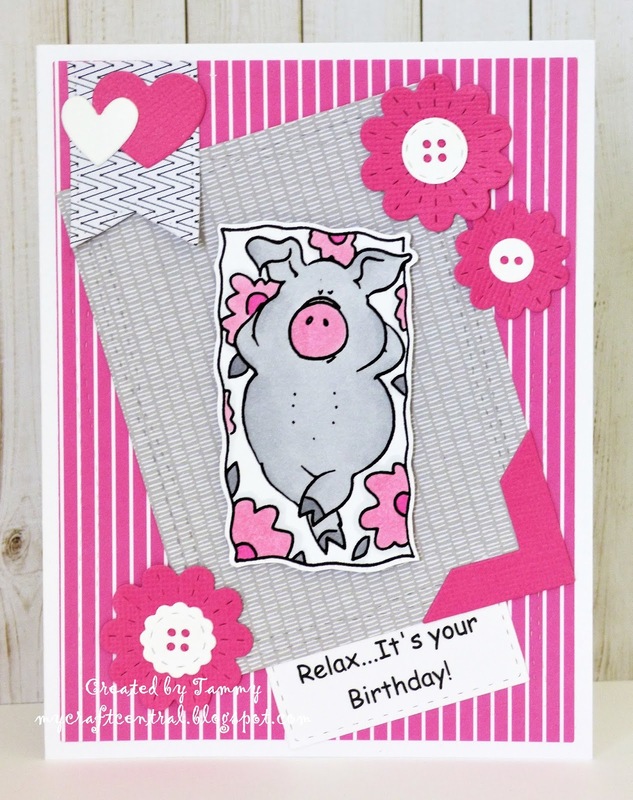 and my card features the adorable Hog Heaven image from Sparkle N Sprinkle! It's colored with Copics, fussy cut out and the sentiment was computer generated. I used My Favorite Things dies for the stitched flowers, hearts, fishtail flag and corner. The buttons were cut with Poppy Stamps dies and the papers are from MFT and American Crafts. I used the sweet and fun 'Big Bear' stamp set from Reverse Confetti again :) but this time the bear is holding a little wagon with a baby bear in it... Oh I love this stamp set! The images are colored with Copics and I paper pieced the scarfs and heart. 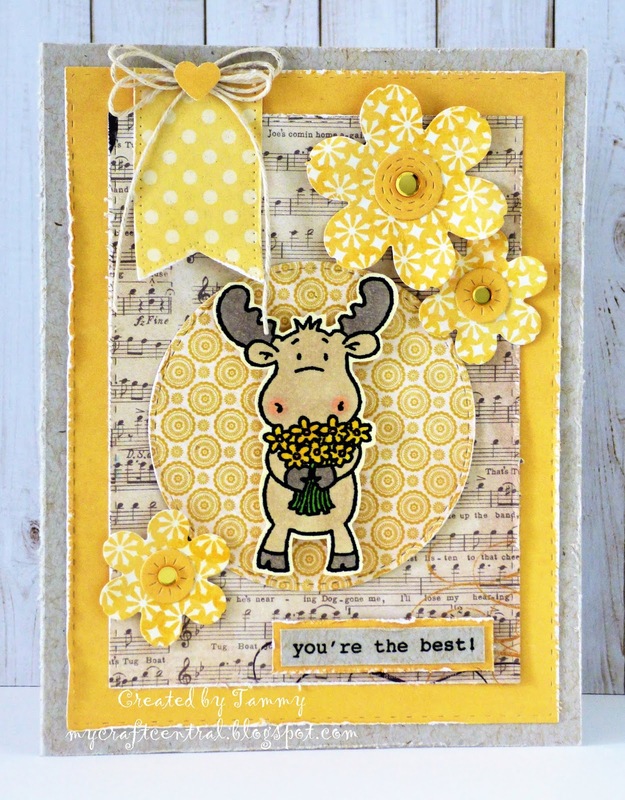 The sentiment is from Studio g and the kraft circle was embossed with the Taylored Expressions Burlap folder. I used a Avery Elle die for the stitched rectangle, My Favorite Things dies for the stitched circles, pierced rectangle and flowers, the pearls are from my stash. Well that's it for today... thanks so much for stopping by and don't forget to pop on over to the main challenge blog to check out the rest of the teams creations! GDT for Crafting by Design! 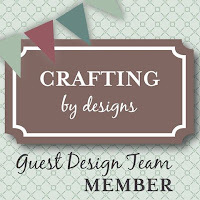 I'm very excited to be posting today as the Guest Designer for Crafting by Design! For the card on the left- I used the 'Salt Technique' with watercolors and coarse sea salt, I stamped the Hero Arts Starburst image in VersaFine Onyx ink and heat embossed with clear powder. The green background was created using Mowed Lawn Oxide DI and Rangers Old School Number stencil. 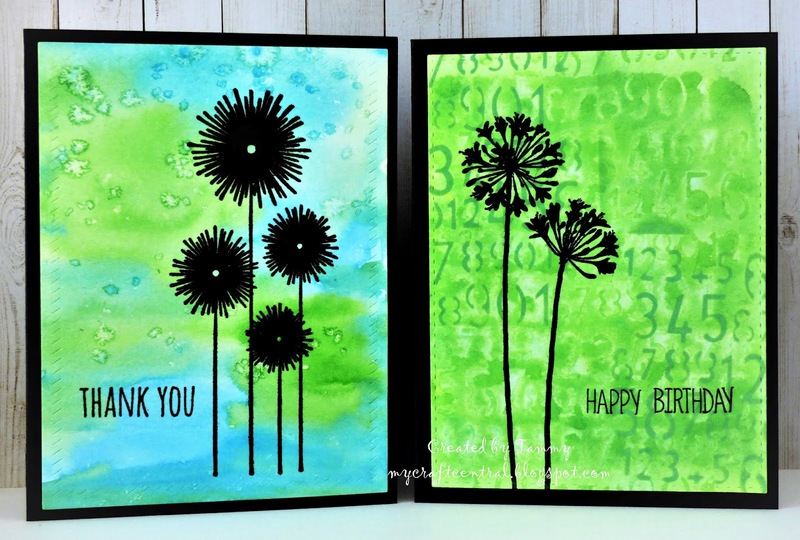 The Agapanthus is from Stampendous and the sentiments are from Tim Holtz. 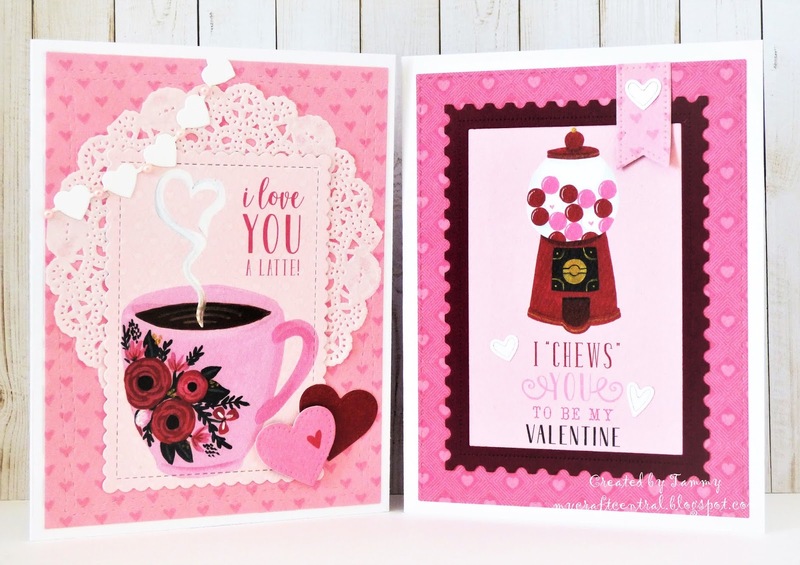 Thanks so much for stopping by and don't forget to pop on over to Crafting by Designs to join the fun... I'll see you tomorrow. 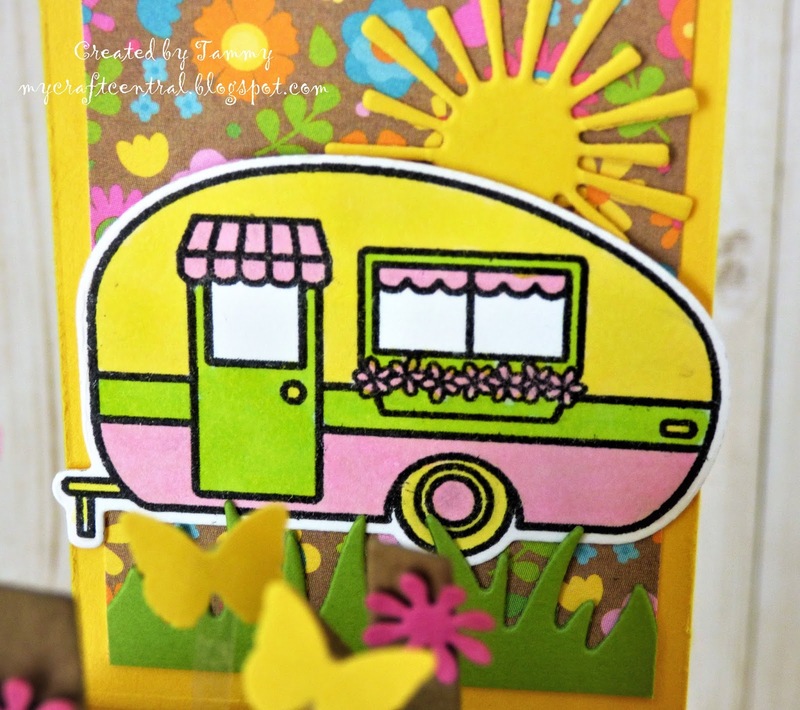 I stamped the camper (Sunny Studios Stamps) in black licorice ink and colored it with Copics, the sentiment is computer generated. 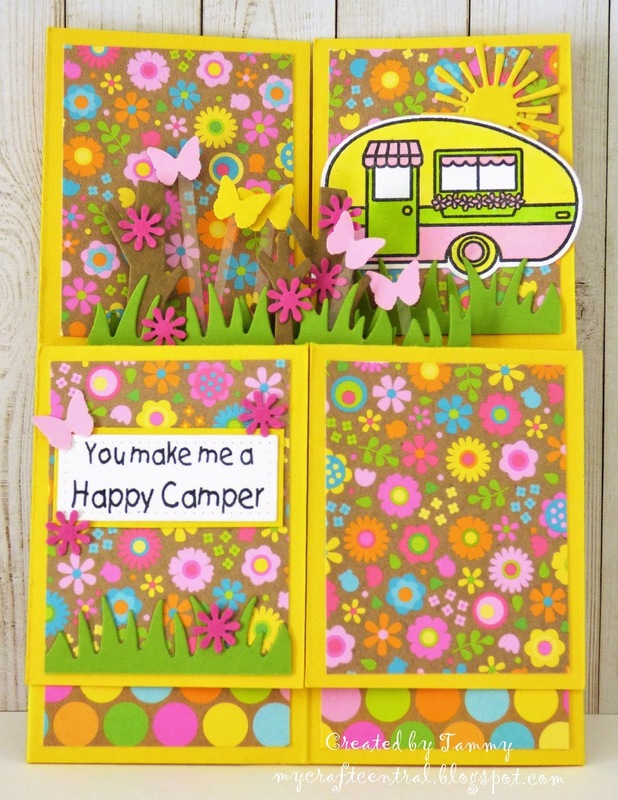 The papers are from Doodlebug Designs, I used Lawn Fawn dies for the grass & trees and a Joy Crafts die for the sun. and here's another view- ready to fit inside a A2 size envelope. 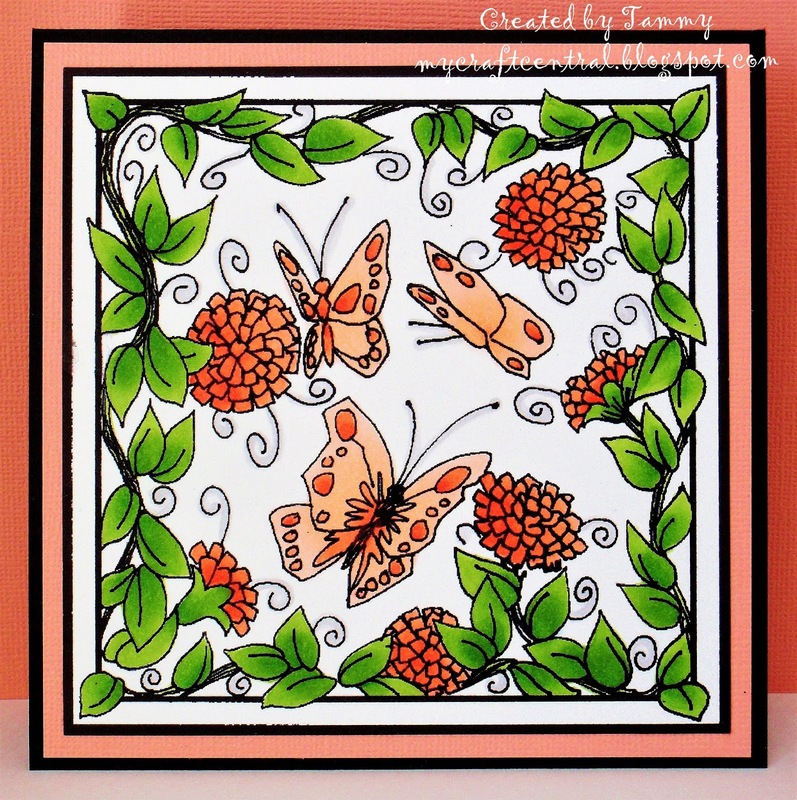 I attached punched butterflies to tiny strips of acetate and added some small punched flowers. 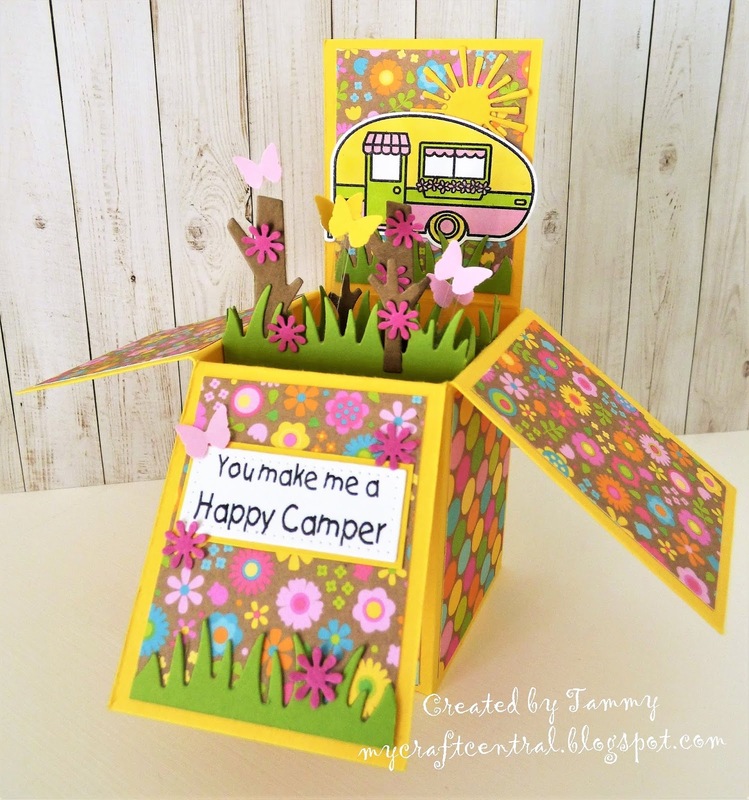 I hope you can join us and don't forget to pop on over to the main challenge blog to check out the rest of the teams gorgeous pop-up box cards! 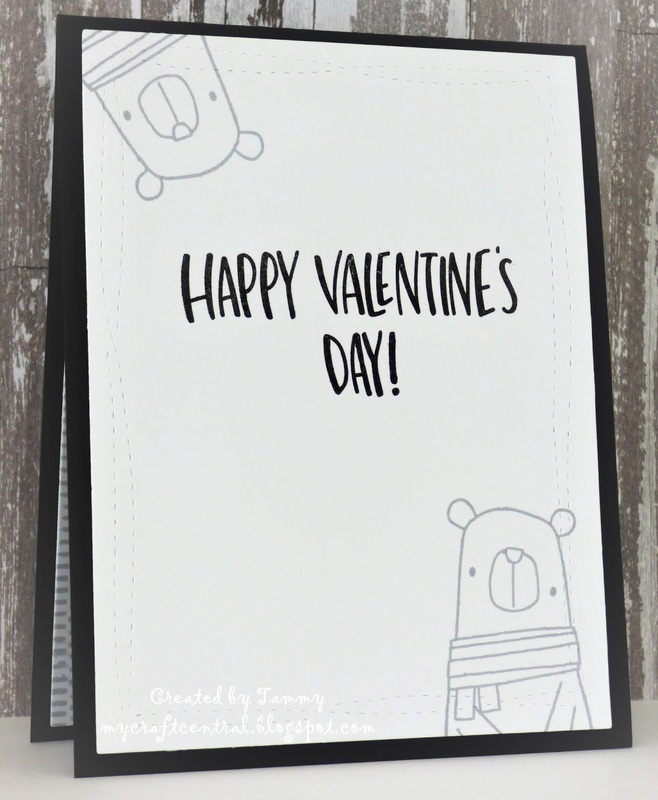 I wanted to pop in today and share the card that I gave my husband yesterday for Valentine's Day! 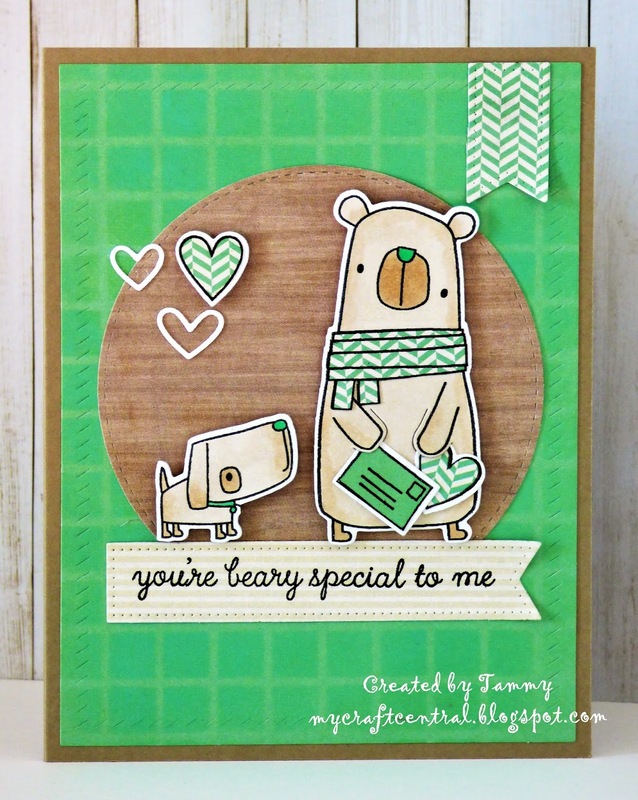 :) I used the adorable 'Big Bear' stamp set from Reverse Confetti again and this time the bear is holding the dog's leash... so cute! To create the background I used Hero Arts Soft Granite Shadow ink and My Favorite Things Make Your Mark background stamp. The sentiment on the front of the card is from My Favorite Things along with the heart dies. Here's a peek of the inside... I stamped the bear in the same Hero Arts ink, the sentiment is from Simon Says Stamp and I used a Avery Elle die for the stitched rectangles. 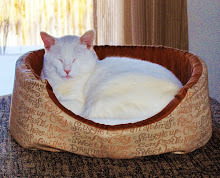 Good morning everyone and Happy Valentine's Day! A new challenge starts today over at Cardz 4 Galz and the theme is Weather Conditions. So we would like to see rain, snow, sun, clouds or maybe wind... so many possibilities! My card features a sweet image from the 'Buddy and Duck' stamp set from Penny Black... it's colored with Copics and fussy cut out. 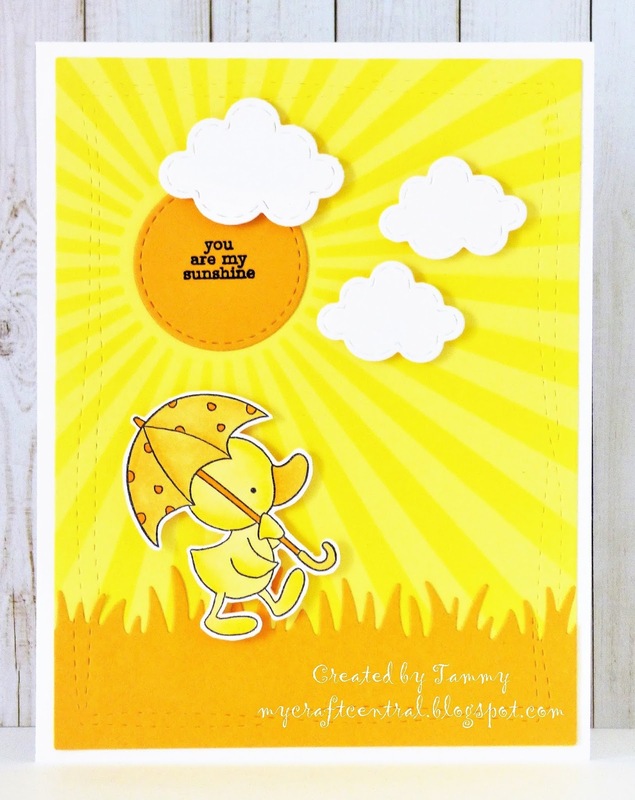 I used a My Favorite Things stencil and Squeezed Lemonade Distress ink to create the sun rays and the sentiment is from Simon Says Stamp. I used a Taylored Expressions die for the stitched clouds, Lawn Fawn die for the grass and a Avery Elle die for the stitched rectangle. Today starts a new challenge at Back to Basics and Beyond and the theme this time is Paper Piecing! The images are colored with Copics and I paper pieced the scarfs, letter and two hearts. 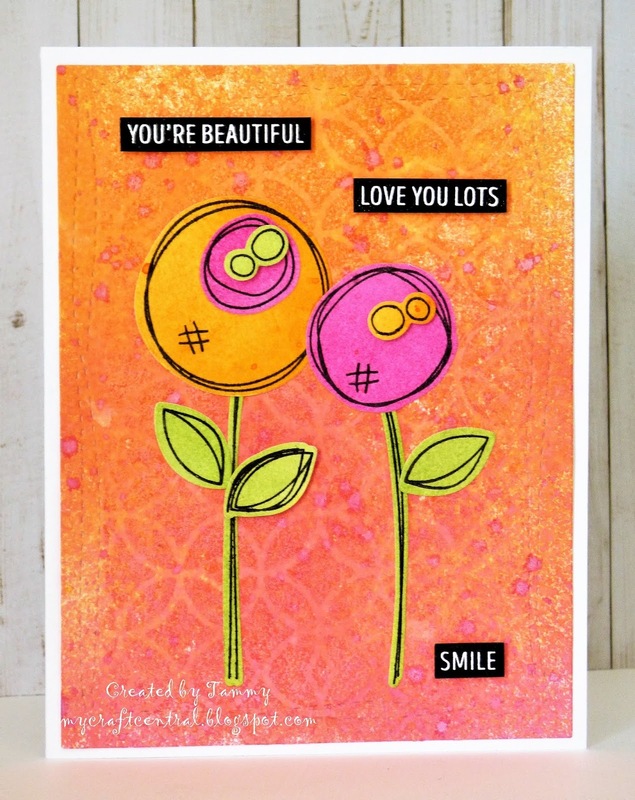 The background was created with Cracked Pistachio Oxide ink and Simon Says Stamp Grid stencil. I used My Favorite Things dies for the pierced fishtail flags & stitched circle, Simon Says Stamp dies for the hearts and a Avery Elle die for the stitched rectangle. 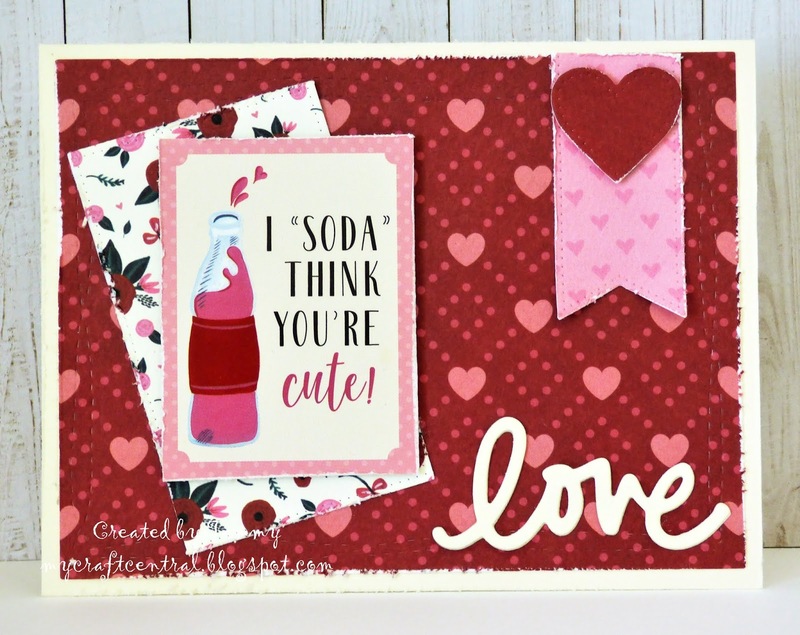 Thanks so much for stopping by and don't forget to pop on over to the main challenge blog to check out the rest of the teams beautiful paper pieced creations! 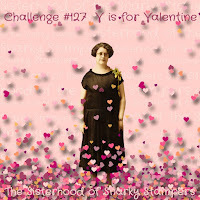 Today starts a new challenge at Cardz 4 Galz and this time we would like to see Red, Pink or White Hearts on your cards. 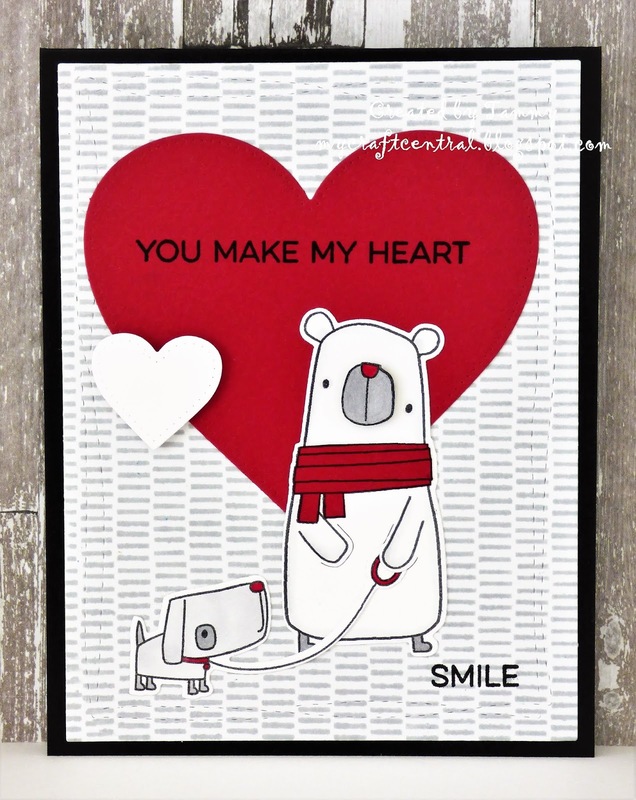 I want to donate several Valentine's Day cards this year so when I saw the cute 'Hello Sweetheart' collection from Echo Park I thought it was perfect!